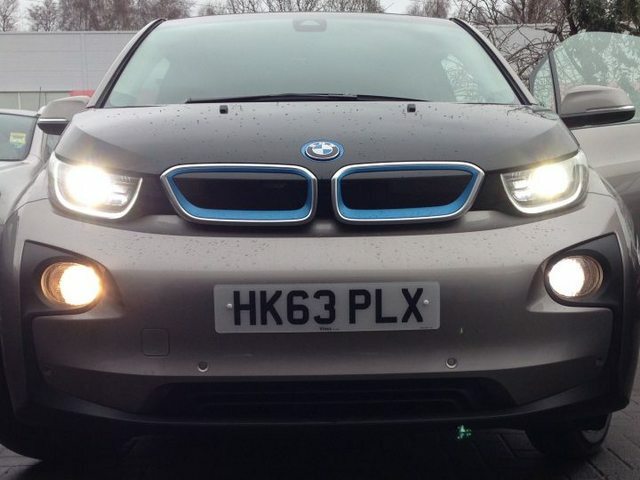 The halogen high beams that ship with the i3 are very yellow in color compared to the LED headlamps. 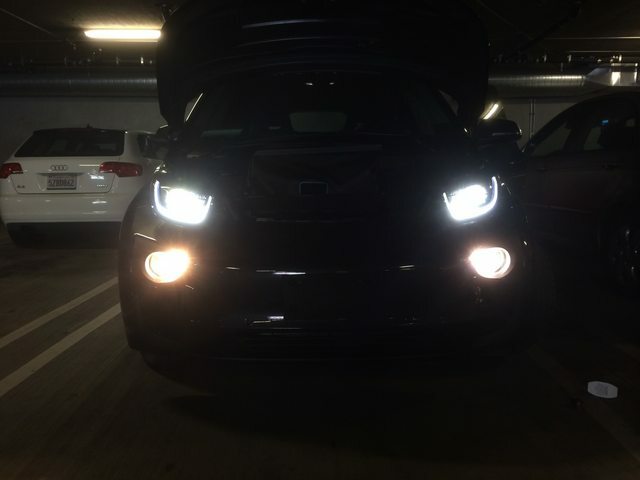 Here's a DIY on how to replace the high beams in your i3. The following steps are also applicable if you need to replace the turn signal bulb next to the high beam. These steps are not documented in the US users manual. 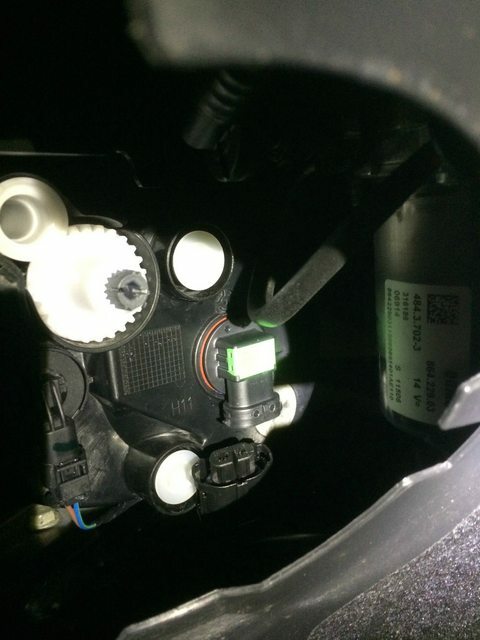 The high beam is located below the main headlamp assembly. 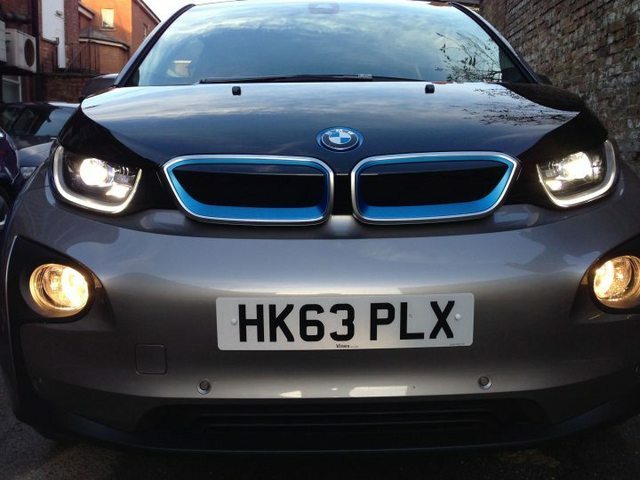 Here's AndyW's car showing the difference in color temperature between the LED headlights and the Halogen high beams. No tools are required. 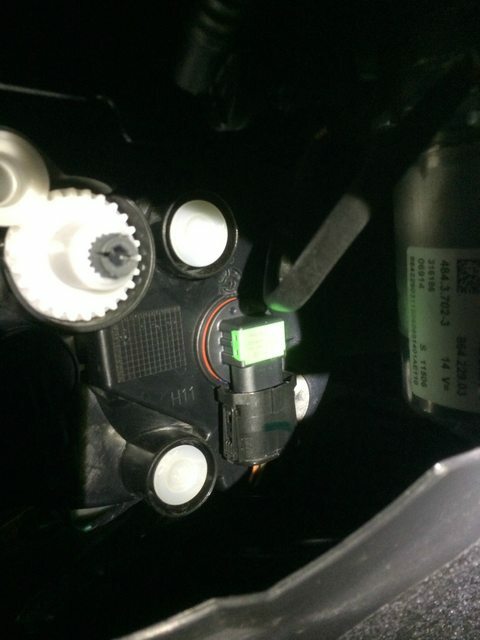 The stock bulb is an Osram H11 55 Watt bulb, which is BMW Part Number 63217160784. I chose to replace this with a Philips H11 CrystalVision Ultra bulb. Any H11 headlamp will work. 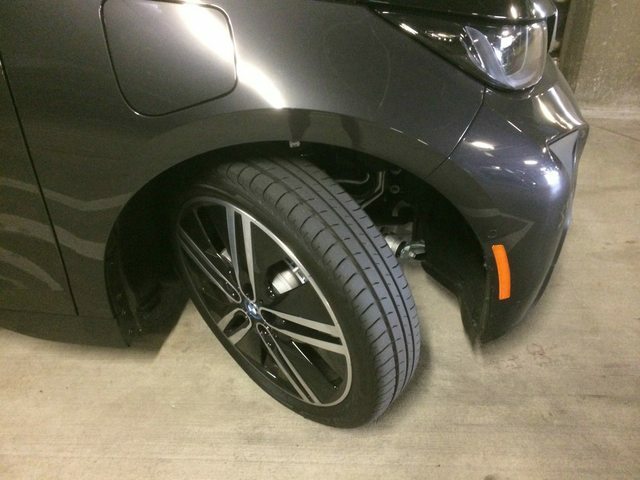 Before beginning make sure that the car is powered off and it is safe to make the repairs. The access panel is circular plastic piece with the cross through the middle and three tabs pictured above. To remove the access panel, rotate it counterclockwise until it releases. 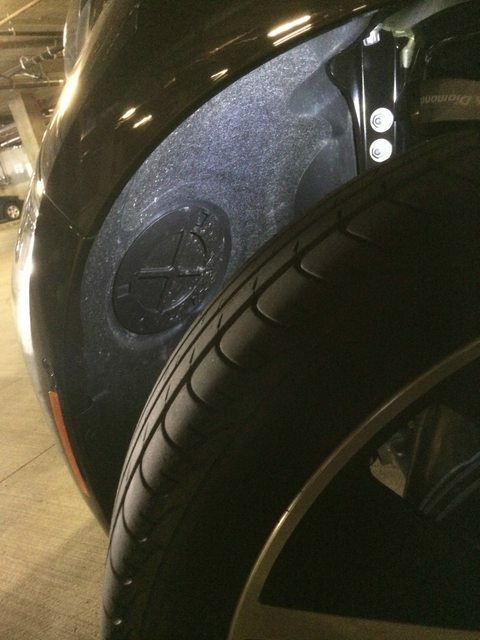 Once it is removed, you'll have access to the high beam and turn signal lamp. Depress the tabs on the bottom of the electrical connector to release. After the plug is disconnected, rotate the entire bulb counter clockwise until you are able to pull it out of the housing. Reverse this process to install the new bulb. thx for posting this, very informative. I understand the desire to color match but are you sure that the yellow color was not because those are fog lights? There are no other fog lights on the car and those need be mounted low, just like what you show, and need to be yellow-ish light in order to reduce glare in foggy conditions... For $16 (ebay) maybe worth trying, changing them seems easy enough. bxb40 wrote: I understand the desire to color match but are you sure that the yellow color was not because those are fog lights? There are no other fog lights on the car and those need be mounted low, just like what you show, and need to be yellow-ish light in order to reduce glare in foggy conditions... For $16 (ebay) maybe worth trying, changing them seems easy enough. Those low mounted beams are the main beams not the fog lights. There are no front fogs. Also note that the left hand side access panel turns anticlockwise to open but the right hand access panel turns clockwise to open. Thanks for the tips. Replaced the high beams and the turn signals with LED's. Much better! Bigbiscuits wrote: Thanks for the tips. Replaced the high beams and the turn signals with LED's. Much better! Which LEDs did you use for the main beams? Philips H11 CrystalVision Ultra bulb. Same as the photos above.